It has been a while since I last posted so today’s post is more a thought piece. For the past few weeks I’ve been reflecting on what it means to walk into destiny and the Lord pointed out to me that the only way to reach our destinies in life is by learning to understand your purpose in life. 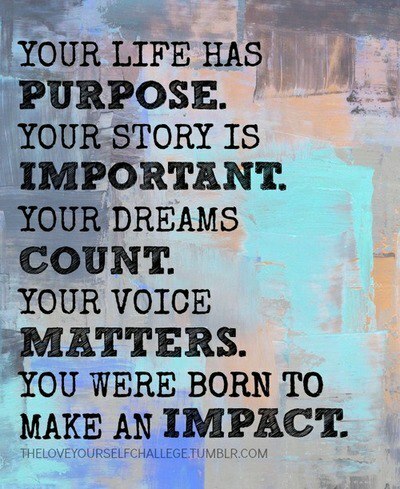 Do you know what your purpose is in life? Do you know that we are all a solution to a question that hasn’t been answered? We tend to figure out who we are by recognizing what makes us tick, what inspires us, what moves us, what makes us want to act on something and we tend to find the answers to these questions by looking out for things that we want to change. The desire to change something and make something better is a clue as to where our destiny lies. Sometimes as we grow up we have an idea of what we want to be, but the full picture isn’t always clear until God reveals to us what our true purpose is in this life. I sometimes look within myself and wonder, what am I here for? Each day I see areas that I am a solution to different problems. I’m convinced that we were all created to heal this broken world. In fact, we are all ordained and set apart (sanctified) to heal this broken world. We may all operate at different capacities, however, we were all created to give glory to God through our talents and abilities. Although we are all born with various talents and abilities, not everybody is walking in their destinies because they aren’t walking in the right direction. When someone isn’t walking in the right direction, they walk away from what God intended them to be because they are lost. Unfortunately, there are a lot of lost people in this world and that is why it is so important to seek to do God’s will as Christians. Understanding God’s will helps us to understand our purpose in life which leads us to walk towards what we were destined to be; a solution to a broken world that doesn’t know Jesus Christ is the answer regarding their identity. The one thing we must do is entrust our destinies in the Lord’s Hands. We all have dreams, but only God can help us make these dreams a reality. The focus here is to trust God with all our heart, with all our mind and with all our soul. We cannot move forward without believing in the Author and Finisher of our destiny (Hebrews 12:2). When we understand Jesus, we can then learn to understand ourselves and our purpose. So we must seek to understand our purpose in order to walk with a purpose. Those who understand their purpose have the ability to steer others who are lost to find their purpose. When you have a clear vision of who you are in Christ, you are able to draw others towards Him by the very nature of God’s presence that resides in you to be a fisher of all men and women (Matthew 4:19). The only way to understand your purpose is to learn to BELIEVE IN YOURSELF because God already Believes in YOU. In the same way, we must put our Trust in God for our lives because He is the one that guides us to our purpose. So Today, focus on leaning on God to Understand your Purpose, because purpose is tied to you believing in God for your destiny so that you can walk in it. I have a song here to bless your spirit today by VaShawn Mitchell feat. Kierra Sheard called I Will. May it bless you abundantly everybody! Wow, very interesting, keeps sharing these things with us, please.